This week I ate dinner off a real plate with real silverware, and then washed it off in my very own sink and put it in my very own dishwasher. It was absolutely amazing! 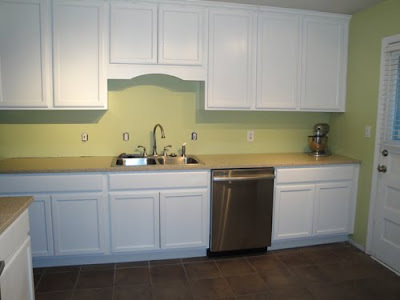 Here is a look at my kitchen with countertops and appliances. 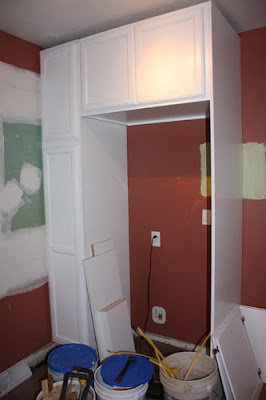 We still have a lot of little things left to do, such as install the hardware, put up trim, tile the backsplash, and of course accessorize :o). 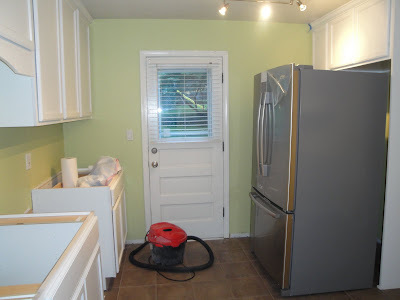 But the kitchen is functional and I am loving it. This weekend I am going to unpack all of the kitchen items that I haven't seen since May. I also plan to do some cooking and baking. What a wonderful weekend! 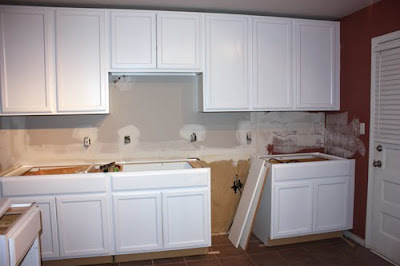 I'm finally back with a little bit of kitchen progress. 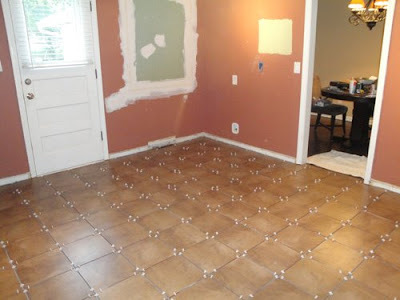 First, here is a better look at our tile floor. 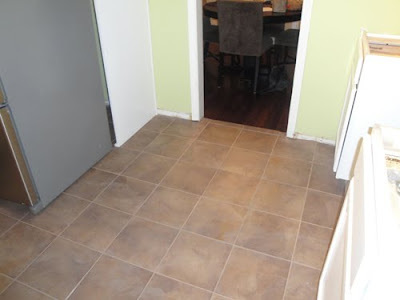 Not too shabby for a couple of kids who have no idea how to lay tile :o). 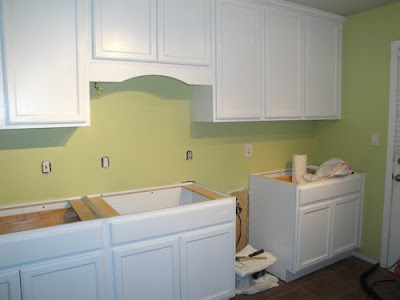 And here are some photos with cabinet trim and green paint. I was having a hard time getting a good picture of the paint color. This is pretty close. I'm in love with the white and the green. Even though we removed a window, the room still looks bright. 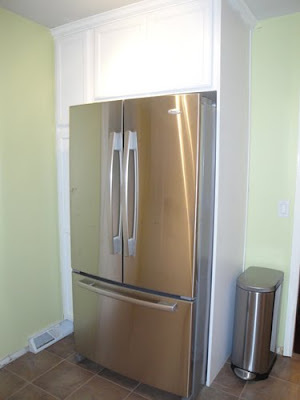 Hopefully you have figured out that our fridge is not yet in place. No, it will not reside in the middle of the room. There was a bit of hang up trying to slide it into place. But hopefully that problem will be resolved by Tuesday. 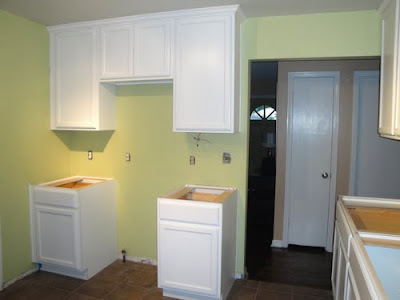 The plan is countertops tomorrow, and appliance installation on Tuesday. I can't wait! One of my coworkers is getting ready to pop, and the girls at work recently got together to shower her with some baby love. I'm not going to lie I am pretty sure she is stocked with diapers! I put together an invite and a diaper cake, so I figured I would share. 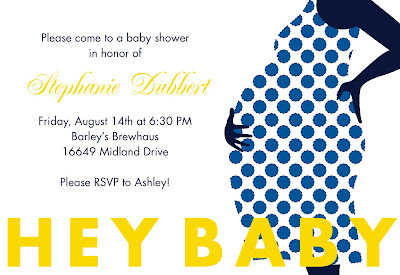 Here is the invite that I put together. Nothing too crazy, but I like the way it turned out. 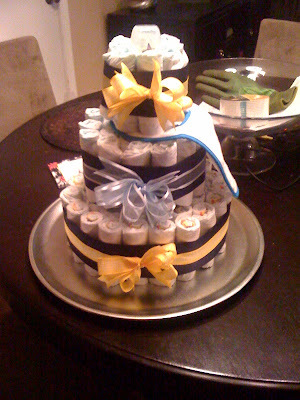 And here are a couple of pictures of the diaper cake. Of course I'm an idiot and only took pictures on my phone, so they are rather horrible, but you get the idea. While at dinner one of the cooks and the manager came by and asked us what kind of cake it was. 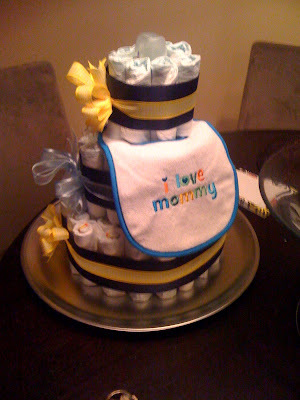 When we told them it was a diaper cake they looked a bit confused... "So you don't eat it?" No guys, you don't eat the diapers. Ha ha. I am so excited! 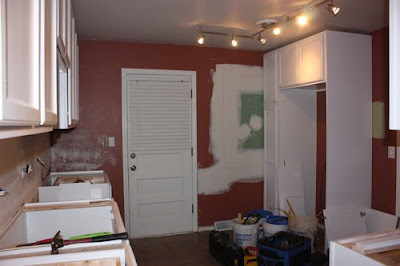 Obviously there is still a lot of work to be done in the kitchen, but the bulk of it is done. 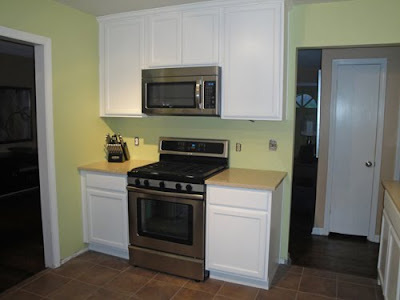 I can't wait to see my kitchen all put together. Painting this weekend! 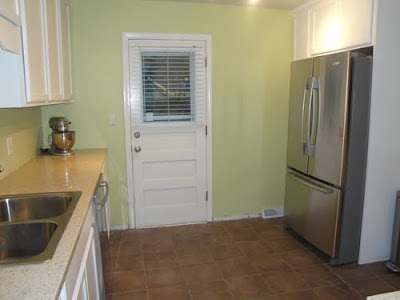 The color of the tile looks absolutely disgusting with the wall color. But thankfully we will be painting that soon. Tonight we grout! I have been too lazy to upload photos, and I feel like a post without photos is somewhat lame, therefore I haven't been posting. But I feel like that is rude as well, so right now you are getting a lame no photos post. 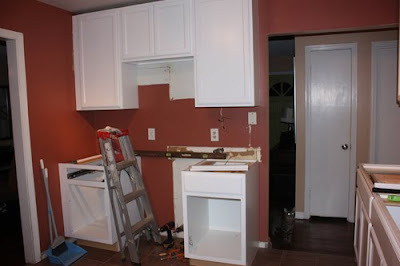 Non demolition work finally began on the kitchen this past Friday. It was so exciting! Our house now has one less window, a few new outlets, and a relocated gas line and water line for the fridge. Yesterday was a rather busy day at our house. We started off by throwing all the demo trash into the dumpster that was delivered Friday. Then my lovely hubby mowed the lawn (after letting it grow for three weeks! Ok so I could have mowed it... but like I said, I've been lazy :o) Our brand new Whirlpool appliances got delivered, but unfortunately have to live in my garage for a little while longer. We made a trip to Home Depot (ok like three or four) gathering supplies to tile our floor. And finally Chris and Kyle prepared the subfloor for the tile. Whew!